The popular teaching of renowned pastor T.D. Jakes coupled with the timeless message of Scripture. 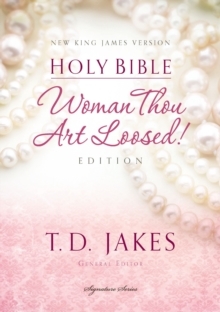 Woman Thou Art Loosed addresses emotional and spiritual issues from a biblical perspective and offers encouragement as only T.D. Jakes can do. Countless women of all ages, races, and denominations have found these unique features to be the resources they need to find healing and wholeness in their Savior. Features include:Leading Ladies-portraits of biblical womenMore than 150 articles to instruct and encourage toward personal wholeness and releaseSoul Secrets-prayers written by T.D. Jakes to help pray through the sensitive issues of life"Where to Find Her" index to women of the Bible600 Gospel Pearls-T.D.